Day 5, I worked on knitting a hat for child #2. Day 6, two short sleeved t-shirts to go with the pajama pants. And since Dad got his clothes miniaturized before, this time it was my turn. 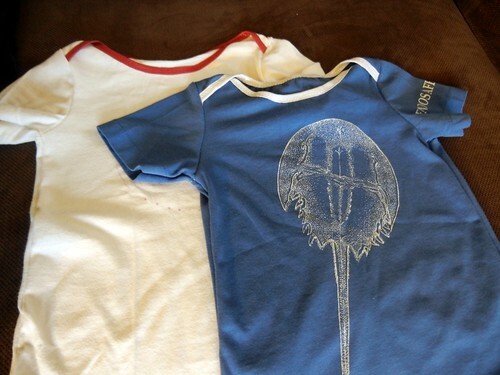 My original pi shirt, and my horseshoe crab shirt. You may notice some purple dots on the front of the pi shirt. I was going to do an op art design like this on the front, (the original front had an unfortunate scorch mark) but it was making my brain hurt. So I left well enough alone. Ottobre 3/2011, #12, the Happy Animals t-shirt, again in size 86. I cut the sleeves out of the original sleeves, and they’re a little longer than the pattern calls for, if I recall correctly. The bottoms are currently unhemmed, though I may take care of that one of these days, and I used fold-over elastic for the neckline binding. 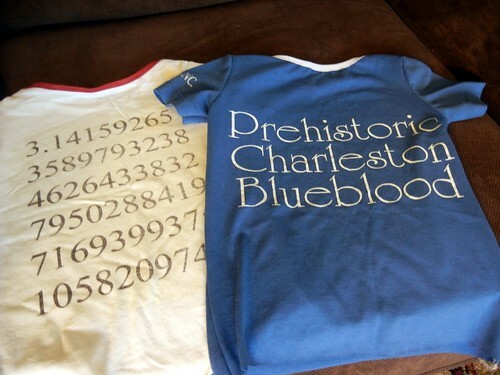 I’m getting better at it too, though the back neck on the pi shirt is a little gape-y. Then Day 7, I decided it was time to work on stuff for child #2 (currently called Peanut) again. So I worked on receiving blankets. 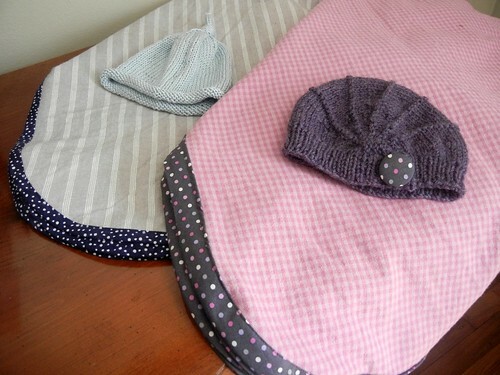 Which aren’t clothes, necessarily, but for a newborn, they’re just as good. I finished up on what I’m calling Bonus Day. There are two sets because we don’t know the gender (not, Lord help me, because I know there’s one of each, which is what someone from the yarn store wondered). I’ve been enjoying the mystery, but I thought we should have something appropriate to take pictures with at the hospital. Just flannel receiving blankets (though probably three times as large as the ones you buy at the store), with quilting cotton bias binding. The navy is just regular bias binding. The gray, I cut at a 30 degree angle, and extra wide to make the polka dot pattern look right. So now it’s time to get cracking on the rest (less cute parts) of the hospital bag!